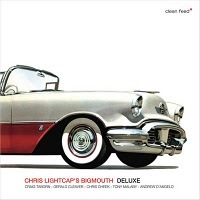 Bigmouth — a project of bassist Chris Lightcap — apparently is inspired by stretched-out, two-toned, tail-finned, white-wall-tired cars of the mid-’50s, in reference to the cover art on Deluxe. The music is ultra-modern from a compositional standpoint, only hinting at neo-bop while pushing the creative improvised harmonic envelope. Lightcap’s expertise on the bass is second to none, as he pushes and prods his way through these original works with an absolutely stellar band of drummer Gerald Cleaver, electric keyboardist Craig Taborn, tenor saxophonists Tony Malaby and Chris Cheek, and on three tracks alto saxophonist Andrew D’Angelo. While some allusions to the vintage autos are reflected in the titles, Lightcap’s vision is of the future, a heady mix of heart and soul embedded in this refreshing new music. The human cry from the three saxophonists in tandem shows their individual strengths abandoned for the common good, especially during the meaty, weighty “Ting,” as an active Lightcap sets the tone in 6/8 time while the stabbing Fender Rhodes of Taborn provides alternate tangents. The music is centered but perfectly identified by shooting out many sparks and shafts of light. “Platform” and “The Clutch” have Cheek and Malaby in saddened or hunched-over moods, funky in odd meters, as if on a long junket to nowhere. There are even darker or bluesy images conjured — slow, deliberate, or swinging — but Lightcap’s slap bass as a prelude for the rockin’ “Fuzz” gives a clearer view of what might be representative of a road song, and a signature sound in relation to the hot rod or classic car. This is a terrific recording from an incredible band that everyone who enjoys these musicians — as individuals or bandleaders in their own right — should play frequently while rolling down the superhighway of life.